Due to their gentle nature, manatees are the perfect swimming companions. There are many companies in the Crystal River area that offer tours by boat and in the water. Swimming with the manatees is an unforgettable experience for all ages. Click Here for a Free Home Value Estimation! 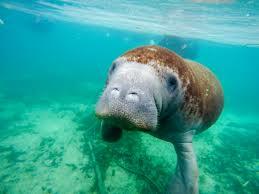 A protected species, manatees, are large, aquatic mammals with two front flippers and a tail paddle. They are gentle, slow-moving swimmers that consume approximately 15% of their body weight in food each day. 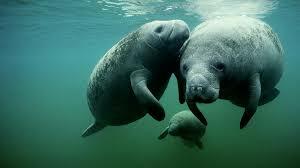 Manatees follow a vegetarian diet of aquatic plants that are floating, submerged, or emergent. There are times when they do eat small fish and invertebrates. Manatees must come to the surface of the water to breathe. They may surface an average of every 5 minutes when they are actively swimming or feeding but can surface every 20 minutes if they are at rest. Manatees bred throughout the year with a gestation period of 13 months. A young manatee is called a calf and can weight around 60 pounds and be 4 feet long. Adults can reach upwards of 13 feet in length and weigh 3,000 lbs. Due to Manatee Safe Zones and the fact that they have no natural enemries, manatees can live to be a ripe old age. Snooty the Manatee passed away in 2017 at a ripe old age of 69 years. Interested in helping when it comes to the protection on manatees? Click Here to Adopt a Manatee! Manatees love to spend the summer months in places like Texas, Massachusetts, South Carolina, and Georgia. Because they are a migratory species, they love to spend the winter months in Florida. Crystal River is a popular destination due to the 72 degree waters that are so appealing to manatees. It’s not unusual to find more then 400 manatees enjoying these warm waters, which draws those who want to see and swim with the manatees. There are numerous companies in the Crystal River area that provide services to those wishing to see or swim with manatees. Here are just a few! Plantation on Crystal River offers education along with the experience so that you get the most from your tour. The snorkeling tour takes place in 1.5 to 2-knot current, which makes make mild snorkeling conditions. River Ventures offers a three-hour tour that includes masks, snorkels, and wetsuits. They have a photo package and do trips seven days a week throughout the year. Crystal River Watersports offers three-hour tours that include wetsuit, snorkel, mask, and vest. They do provide semi-private boats and can accommodate larger groups by having boats travel together. Your real estate agent is the best source of information about the local community and real estate topics. Give Brock Realty a call today at 941-313-1234 to learn more about local areas, discuss selling a house, or tour available homes for sale. Swimming with the Crystal River manatees is a wonderful adventure. 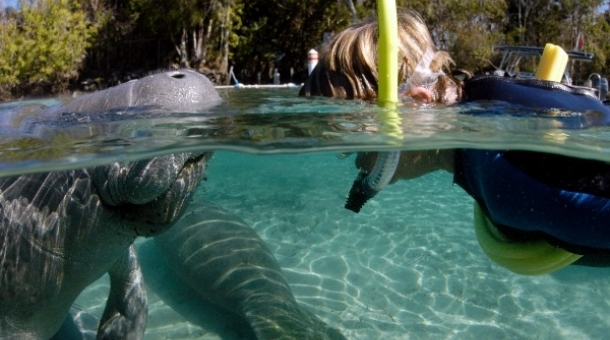 Learn more about the manatees and where to find tours. © 2019 · Brock Realty, Inc.